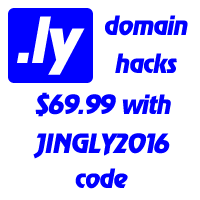 On top of our interest in art and creating impressive domain jingles, at Name.ly, we also do serious.ly care about the environment and the carbon footprint of us and that of our visitors. Our servers run on 100% renewable energy providing you with 100% green hosting. Please find the certificate (in German) from NaturEnergie, an electricity company, issued to Hetzner, our hardware provider. Sign up for your free 100% green sites or brief and consolidating URLs.